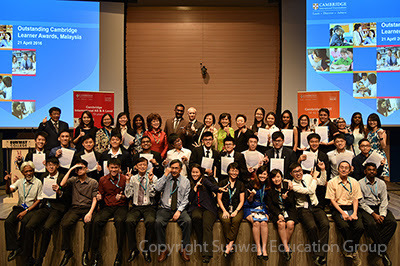 It was a proud day for 20 A-Level students from Sunway College as they went on stage to receive awards at the recent Cambridge International Examinations (CIE) Outstanding Cambridge Learner Awards. The 20 students took home 24 out of 92 awards, with 15 receiving Top in the World, seven Top in Malaysia, one Best across Three Cambridge International A Levels and one Best across Four Cambridge International AS Levels. Former International Mathematical Olympiad (IMO) winners, gold medalist Anzo Teh Zhao Yang received the Top in the World award for Cambridge International A Level Mathematics. Tharshini is currently pursuing Accounting and Finance at Monash University Malaysia and hopes to work with the Big Four upon finishing her degree. Another KPM scholar from Penang Lin Zi Khang who scored straight A*s in 3 subjects in the AS Level and 4 subjects in the A2 Level was awarded the Best across Three Cambridge International A Levels. “I have gained more knowledge and I think the best experience out of my A-Level is definitely the people I have met. I have met many people here – the lecturers are kind and patient and I am grateful for their guidance, I have also made new friends whom I believe are friends for life”, said Lin. “Staying far away from home for the very first time is definitely a good experience. There are all together 8 KPM scholars, all studying A-Levels for the same July intake, sharing a unit in Sunway Monash Residence (SMR). All of us got solid results, some got straight A*s and others scored at least 3A*s and 1A. As my housemates come from very diverse backgrounds, I’ve learned to meet new people and improve my networking and socialising skills. The experience also gave me more confidence to pursue my degree abroad. “I have received an offer to study Mathematics at Churchill College, University of Cambridge but I am now actively looking out and hope to secure a full scholarship to Cambridge”, he further explained. Choo Hao Rui from Kuala Lumpur took home 2 awards for the day, a Cambridge International AS Level Top in the World for Mathematics and Cambridge International AS Level Top in Malaysia for Thinking Skills. Taking home the Best across Four Cambridge International AS Levels and a Cambridge International AS Level Top in the World for Mathematics was Teh Boon Jie from Sungai Petani, Kedah. Teh who is pleased with his result said he spends a lot of his time at the library studying. He feels he is prepared for the upcoming examinations in June. Although citing Mathematics as his favourite subject, Chin Teck Yang said he never expected to receive the Cambridge International AS Level Top in the World for Mathematics. He is very grateful to his lecturers Ms Wong Sock Leng and Mr Yong Yau, who have been very supportive. Another recipient of the Cambridge International AS Level Top in the World for Mathematics award Teh Zee Hoe said he was very happy with his achievement. In preparation for the exams, he said he did 3 sets of questions daily, each set containing 10 questions. He hopes to pursue studies in Dentistry or Medicine in China or Hong Kong. This CIE Outstanding Cambridge Learner Awards is the very first for the November examinations. Held at Sunway, the event was graced by YB Dato' P. Kamalanathan, Deputy Minister of Education I, Ministry of Education Malaysia. Also in attendance were Dr Ben Schmidt, Regional Director Southeast Asia and Pacific, Cambridge International Examinations; Mr Ng Kim Huat, Country Director- Malaysia and Brunei, Cambridge International Examinations and Dr Elizabeth Lee, Senior Executive Director of Sunway Education Group and Sunway University.